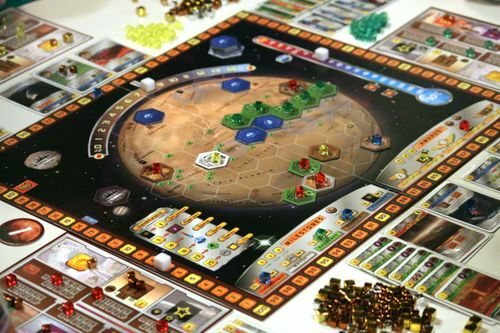 Recently I acquired a new board game dubbed Terraforming Mars. 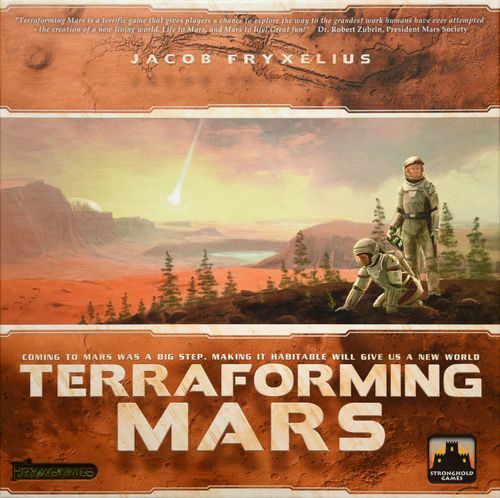 The game is developed by Jacob Fryxelius and published by Stronghold Games. It has a price tag of around 60 EUR / 45 USD on Amazon. The game has an impressive rating of 8.4 on BoardGameGeek.com. The game can be played by 2 to 5 people. The box says a game should take 90 to 120 minutes, but in my experience it’s more like 2 to 3 hours (I’ve played 20+ games so far). You start out by having a set production for your corporation, some starting capital and a corporate feat, which may help you throughout the game to a greater or lesser extent. The games is played in rounds (simulating generations in timespan), where you go through phases of producing resources, buying project options, spending money to built said project or from a set of standard projects. Players take turns performing one or two actions per turn. When everyone is done, the round ends and a new one begins. Each project can have a variety of effects, of which some raises one or more of the three global parameters (oxygen, water and tempetature). When all these parameters reach a set level each, the game ends. During the course of the game you raise your Terraforming Rating, which ultimately serves as Victory Points. The player with the highest amount of victory points is the winner. The game is composed of both cards and a board on which you play tiles, thus giving an additional way to interact with other players. Terraforming Mars has me hooked on a number of things, which is why I’ve played more than 20 games in the course of 4 weeks. First off it has a set of really interesting mechanics. I’ve found myself pondering over which projects and actions are the best, what the return on investment is on each, how I should sequence them and lastly what my opponents are doing. I’ve played 2-player games by far the most. Even here the actions taken by my opponent in these games are an important enough factor, that I could never successfully disregard this. Another interesting thing is that the resources you produce over time enable you to complete more projects, making you produce even more resources over time. Thus building up resource production is the most important thing in the beginning of the game. But when the game end all these resources are worth nothing in terms of winning the game – only Victory Points is – which brings in a whole new aspects of when should you shift your focus from producing resources, to gaining Victory Points. The setting of the game is great too. It’s really well executed with regards to mechanics and gives a great ambiance to the game as a whole. I’ve caught myself chuckling a few times, when I read the flavor text on a project card and seen how well the story on it supports what it actually does in terms of gameplay. Complexity wise the game has a lot to offer. More than once I’ve found myself missing things, so if I had to say something negative it’s got to be that the game is best played when you’re not too tired, as it will affect your enjoyment, as misplays will happen more frequently. Terraforming Mars does have an element of luck, but I’ve never felt that you couldn’t make skill count too. It balances a fine line between skill and chance, and it does it well. I see myself playing this game over and over, and are trying to find pockets of time during my week constantly. Terraforming Mars has all the good elements that you could stuff in a box and I am happy to toss countless hours into managing my interstellar corporation for generations to come.